Is Zatkoff the future at goaltender? Questions, questions, I have so many questions. Heading into this upcoming season, which begins October 3rd against the New Jersey Devils, I'm left with big questions about how the team is going to handle some of the major issues they have. First and foremost, I have to wonder about the goaltending situation. Tomas Vokoun’s blood clot, which has been surgically repaired, will keep him on the shelf for an indefinite amount of time. 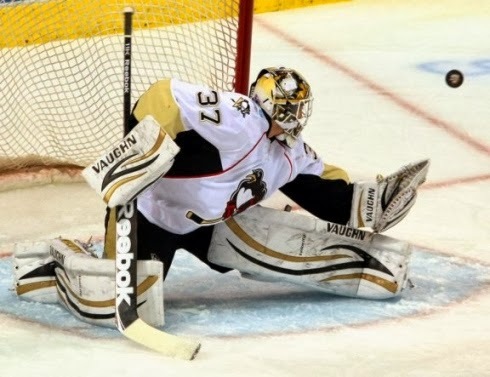 This leaves former Wilkes-Barre Scranton Penguins goalie Jeff Zatkoff as the backup to Marc-Andre Fleury. How will he perform? His stats last season were very good, registering a 1.93 GAA and a .920 SV% in 42 games for the Baby Pens. This, however, is not the AHL. Will he stand tall when new division rival Ovechkin is bearing down on him or will he wilt like a flower? Speaking of Flower, how will he holdup under what is sure to be an increased workload? The season before last, Fleury played in 67 games. He reached that number twice before in his career, but it was apparent that he had run out of gas during the playoffs. Will the lack of Vokoun looking over his shoulder ease Fleury’s fragile psyche and rejuvenate him or will it increase the pressure on him to play well. We’ll see if that sports psychologist is worth the money I’m sure he’s being paid. Another question I have is how the departure of Matt Cooke will affect the “grit” of the team. Players like Matthew Barnaby and Jarkko Ruutu came and went, and Cooke stepped into their role. It goes without saying that the Pens don’t have another Cooke stashed somewhere on the roster, so does the team expect overpriced Tanner Glass to provide that grit? Perhaps Jeffery or Vitale will be expected to take on that role. Maybe, just maybe, that role is fading from the NHL and the Pens will move on just fine without it. How will the young guys, like Beau Bennett and Simon Despres, handle their presumed increased workloads? Will Rob Scuderi fit back into the Pens lineup like he never left? Is Niskanen on the trade block? Is Despres? Assuming Vokoun goes on the LTIR, how will the Pens get under the cap when he returns? As you can see I have many questions, but the Pens will begin answering them in less than a week. That’s when the real fun begins. What do you think? How will the players and the team in general answer these questions? Do you think Fleury will rise or fall? When and how do you think they will address the cap situation?